Whatever else you wanna rant about. So the athletic department announced some new word marks/secondary marks today. 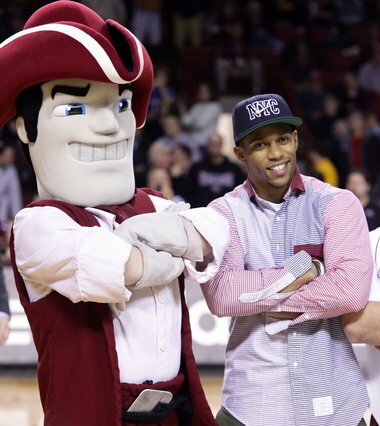 In the article on it, they mention that all the old UMass logos, including all of the ones that feature Sam the Minuteman, have been retired. In a way I get it, because those Sam logos were a bit awkward. But not having a single logo with the team's mascot doesn't seem right to me. Maybe I'm alone in feeling that way, but I'm curious what others think? Would like to know who made that decision. I believe it was IV on Twitter brought up the great point that Sam is on the UM license plates. Just seems like a short sighted decision to not at least have one logo with Sam in it. Although I also wouldn't be surprised if there were rallies held to eliminate Sam from being a mascot because it is insensitive to people from Great Britain that might have lost family members in the Revolutionary War. Update: Associate AD Molly O'Mara responded to RSox on Twitter saying Sam is not being completely phased out but to think of it more as being "modernized." Must be holding an AR-15 instead of a Musket. How about a light saber ? So are they going to use all of the ones pictured above or are one or two going to be used primarily? MJatUM wrote: Would like to know who made that decision. I believe it was IV on Twitter brought up the great point that Sam is on the UM license plates. Just seems like a short sighted decision to not at least have one logo with Sam in it. Although I also wouldn't be surprised if there were rallies held to eliminate Sam from being a mascot because it is insensitive to people from Great Britain that might have lost family members in the Revolutionary War. I'd think a better title for this thread would be "Sam the Minuteman logo on sabbatical" or something to that effect lol. I tweeted it when it happened because it makes no sense for such a strong, identifiable, popular brand for the school in Sam to just vanish completely. That didn't make any sense, and I got the answer I suspected when Molly replied that he was being modernized. I imagine there will be some changes, but on the whole I'd expect he'll remain similar to what we have now; the FPC has just his eyes covering an entire wall after all, wouldn't make sense to get rid of him. But this rebranding is a work in progress like she said. With regards to license plates, my current Bruins plate has the old spoked-B logo on it, the one without serifs on it that was in use prior to the 07-08 season. Most Bruins plates are like that. I have seen a couple newer B's plates with the new spoked-B, but the majority will keep the old one. Just a timing circumstance. The UMass plates aren't going anywhere either. They were just having a special opportunity to get a low number plate with a donation on the web site, even single digit plates available for a tidy sum. Those will all probably have that old Sam logo on them, until they devise a new one. Thanks for getting me back off the ledge. I think the Minuteman should be on almost everything. Thanks to ESPN commercials it is a very well known mascot. (The Farve commercial was pure genius). I would like to see Sam on the helmets too. Whether they bring back to 74 helmet, or rip off the old patriots logo, or use a stylized version. I think Sam has plenty of friends in high places to ensure he isn't going anywhere. If I'm Bamford, I certainly wouldn't want to piss off these guys! If they could ever pull off a logo like this but with Sam's head on it - Oh boy, I would buy everything. I hear we're updating the Sam logo first and then the actual mascot costume. Maybe they'll change his skin tone to something other than that of a corpse. I tweeted at Bamford last night about a potential Sam logo. He said "Not likely." So sounds pretty official that there will not be a Sam logo at all. When asked the rationale he replied: "We had a handful of marks until recently which diluted the brand. Have now streamlined to the Power U & state outline as our primary/secondary." I do like the state outline being a secondary logo, but pretty disappointed in not having a Sam logo. 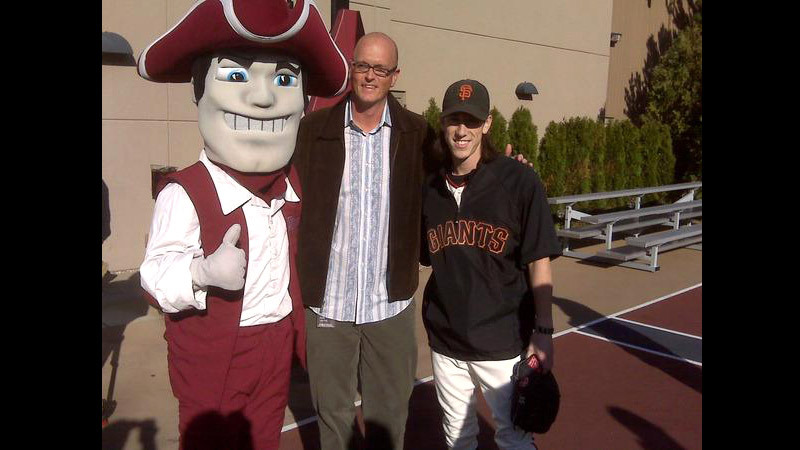 Win some games in the major sports and maybe I'll get excited about what the mascot looks like. I simply don't care. I guess that makes me a bad fan. I sincerely hope this doesn't have anything to do with the "violent" nature of the Minutemen or the fact that some minutemen may have owned slaves. In today's world, anything is possible. I know within the last decade they removed the musket and replaced it with a hockey stick for the UMass Hockey logo. I suspect most people have this mentality, which is perfectly reasonable. Certainly doesn't make you a bad fan. In fact, I'm probably getting over excited about something that doesn't matter all too much. I think mostly I was just looking for a much better Sam logo than the one we used to have. Not having one at all certainly isn't the end of the world.